For other uses, see Airspeed (disambiguation). The measurement and indication of airspeed is ordinarily accomplished on board an aircraft by an airspeed indicator ("ASI") connected to a pitot-static system. The pitot-static system comprises one or more pitot probes (or tubes) facing the on-coming air flow to measure pitot pressure (also called stagnation, total or ram pressure) and one or more static ports to measure the static pressure in the air flow. These two pressures are compared by the ASI to give an IAS reading. Indicated airspeed (IAS) is the airspeed indicator reading (ASIR) uncorrected for instrument, position, and other errors. From current EASA definitions: Indicated airspeed means the speed of an aircraft as shown on its pitot static airspeed indicator calibrated to reflect standard atmosphere adiabatic compressible flow at sea level uncorrected for airspeed system errors. Outside the former Soviet bloc, most airspeed indicators show the speed in knots (nautical miles per hour). Some light aircraft have airspeed indicators showing speed in statute miles per hour or kilometers per hour. An airspeed indicator is a differential pressure gauge with the pressure reading expressed in units of speed, rather than pressure. The airspeed is derived from the difference between the ram air pressure from the pitot tube, or stagnation pressure, and the static pressure. 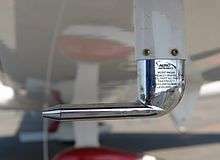 The pitot tube is mounted facing forward; the static pressure is frequently detected at static ports on one or both sides of the aircraft. Sometimes both pressure sources are combined in a single probe, a pitot-static tube. The static pressure measurement is subject to error due to inability to place the static ports at positions where the pressure is true static pressure at all airspeeds and attitudes. The correction for this error is the position error correction (PEC) and varies for different aircraft and airspeeds. Further errors of 10% or more are common if the airplane is flown in “uncoordinated” flight. Calibrated airspeed (CAS) is indicated airspeed corrected for instrument errors, position error (due to incorrect pressure at the static port) and installation errors. is 661.4788 knots;, speed of sound at standard sea level. This expression is based on the form of Bernoulli's equation applicable to a perfect, incompressible gas. The values for and are consistent with the ISA i.e. the conditions under which airspeed indicators are calibrated. Equivalent airspeed (EAS) is defined as the speed at sea level that would produce the same incompressible dynamic pressure as the true airspeed at the altitude at which the vehicle is flying. An aircraft in forward flight is subject to the effects of compressibility. Likewise, the calibrated airspeed is a function of the compressible impact pressure. EAS, on the other hand, is a measure of airspeed that is a function of incompressible dynamic pressure. Structural analysis is often in terms of incompressible dynamic pressure, so that equivalent airspeed is a useful speed for structural testing. At standard sea level pressure, calibrated airspeed and equivalent airspeed are equal. Up to about 200 knots CAS and 10,000 ft (3,000 m) the difference is negligible, but at higher speeds and altitudes CAS must be corrected for compressibility error to determine EAS. The significance of equivalent airspeed is that, at Mach numbers below the onset of wave drag, all of the aerodynamic forces and moments on an aircraft are proportional to the square of the equivalent airspeed. The equivalent airspeed is closely related to the indicated airspeed shown by the airspeed indicator. Thus, the handling and 'feel' of an aircraft, and the aerodynamic loads upon it, at a given equivalent airspeed, are very nearly constant and equal to those at standard sea level irrespective of the actual flight conditions. Aircraft flight instruments, however, don't compute true airspeed as a function of groundspeed and windspeed. They use impact and static pressures as well as a temperature input. True airspeed is equivalent airspeed that is corrected for pressure altitude and temperature (which define density). The result is the true physical speed of the aircraft relative to the surrounding body of air. At standard sea level conditions, true airspeed, calibrated airspeed and equivalent airspeed are all equal. The above equation is only for Mach numbers less than 1.0. True airspeed differs from the equivalent airspeed because the airspeed indicator is calibrated at SL, ISA conditions, where the air density is 1.225 kg/m³, whereas the air density in flight normally differs from this value. is the air density at the flight condition. is the air temperature at sea level, ISA = 288.15 K.
Ground speed is the speed of the aircraft relative to the ground rather than through the air, which can itself be moving relative to the ground.